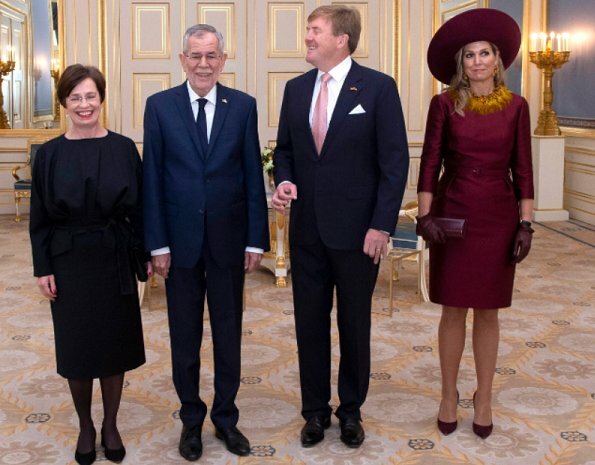 President Alexander van der Bellen of Austria made a State visit to the Netherlands on November 14, 2018, Wednesday. He was accompanied by his wife, Doris Schmidauer. 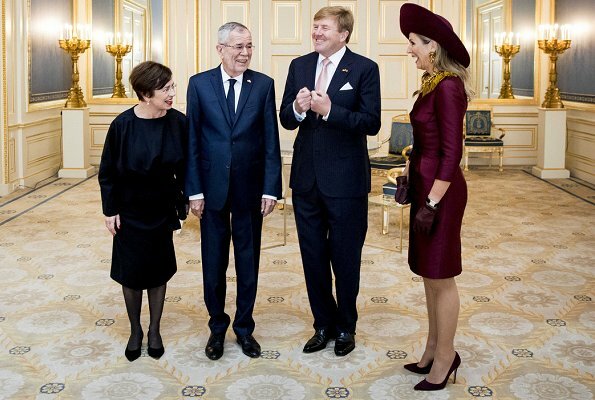 King Willem-Alexander and Queen Maxima welcomed President Van der Bellen and his wife with a state ceremony held at Paleis Noordeinde in The Hague. 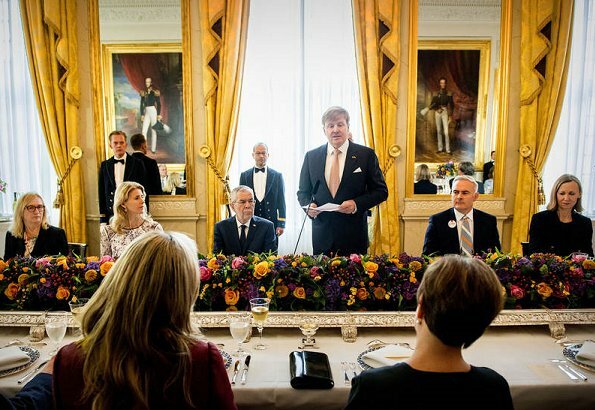 Afterwards, the King and the Queen held a lunch at Noordeinde Palace for the Presidential Couple. Horrid necklace, slightly bulky coat....... Oh max why did you ruin such a win-win look ? Superb color, cut and fit of the dress. A standard winter coat in a complementary color would look better. The gloves..one detail too many. I lobe the coat. It's modern and looks very good on Maxima. Photos 3 and 4 are funny: her eyes look first in this direction and then in the other, while he is standing there like a tin soldier! Yes Coralie, I noticed that too. Maxima always has this look on her face like she's thinking about an inside joke that no one else knows. And that she's about to start laughing hysterically at any moment. Not saying it's bad - just odd. Very nice look... she looks amazing! Love the look, except for the earrings and necklace; they fit neither the style nor the fabric of the rest of the outfit. She could have also done without the gloves. I’m in agreement. 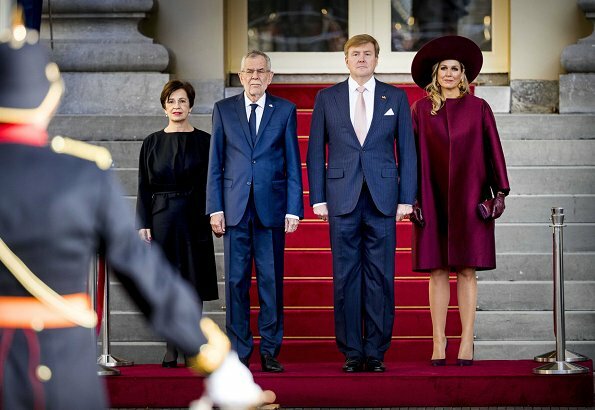 Horrid necklace which detracts from the expert tailoring of the dress which the Queen wears so well. 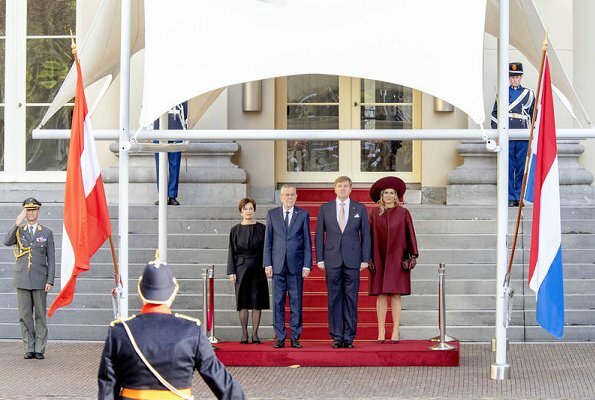 Couldn't the King wear some pants that fit him well? Maxima's huge hat, silly gloves and ugly necklace detracts from what could have been a nice outfit. Maxima looks great apart from the necklace which I really dont like. not sure what that ornament (?!?) around her neck is - but everything else looks stunning. This is a great fall colour and it works for Maxim. 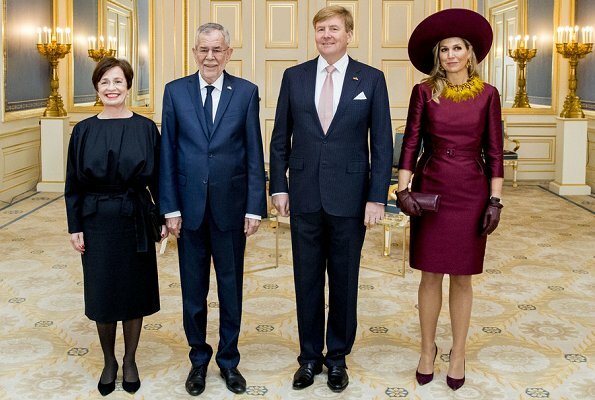 As far as the Austrian President's wife goes... surprises me every time how little interest she has in putting on a more appropriate look when representing her country. Little interest as she may have in fashion, this is more or less just what the cleaning lady wears when she comes to the office. No offense - but it's hard to understand. Surely she could do even a bit better. What a gorgeous coat, bag and shoes. 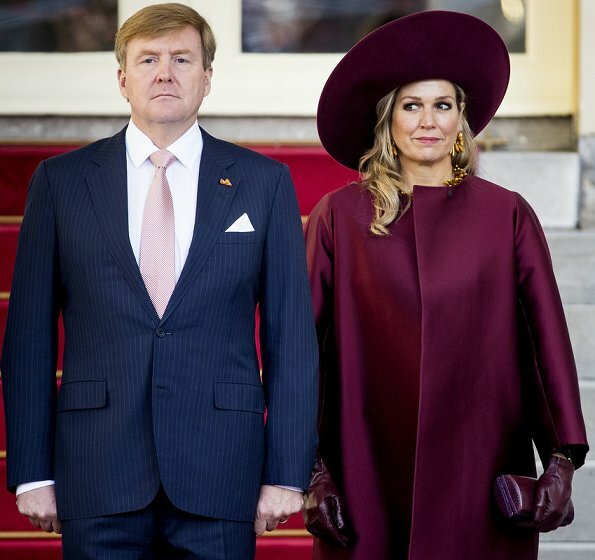 Why can't Maxima leave well enough alone and dump the distracting jewelry. Such a pity. Q Maxima looks very nice I love the color on her. She looks good in large hats. Nice to see she is well again.